I love the Pacific NW! 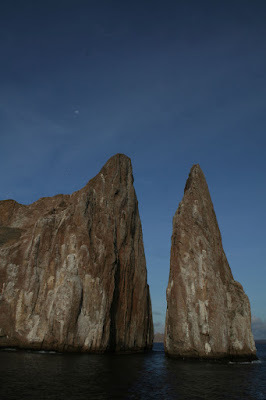 Leon Dormido, or Kicker Rock, the Galapagos Islands, with the moon in the sky. Today I had a spontaneous date with D, and we went to see Taking Woodstock. I really wanted to see The Ugly Truth, which I've heard is funny, but we went to the cheapie matinee and it was too early for us to make it. 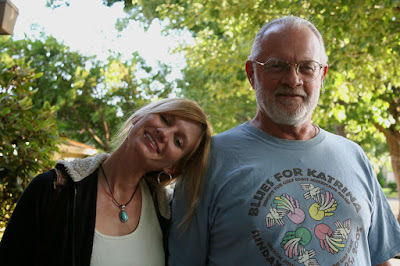 I love the 60s and 70s, since of course my dad was a hippie, I'm hippie spawn, and a "bohemian" you know. 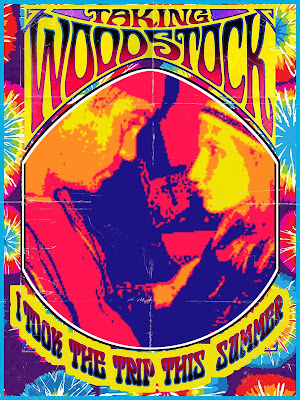 I didn't know much about it other than it was a true story of how Woodstock came to pass. Verdict - meh. It was mildly entertaining because I am interested in the topic but it was slow, it wasn't funny (I don't think it tried to be funny but it easily could have added some humor), and there was none of the awesome music that was at Woodstock. It left you with tons of unanswered questions, like what became of the main character and their parents, and the supposed possible lawsuits. Anyway, I was disappointed in the movie, but it was a GREAT day! In writing news, I have a online writing class starting tomorrow, which is full and the deadline for signup passed, BUT... I just opened another session for Oct 17th, and if you're interested in more info, check out the website for the class or email me (email is on the website)! I designed the course to take you through everything from the writing process itself to understanding markets and magazines to writing killer queries - which is the way writers propose a story. It has worked for aspiring writers and established pros alike, as it can be tailored to each person's interests and skill levels. It's really a fantastic value and I get a lot of positive feedback from people who have taken it! Though it's technically designed for people interested in "writing green" - including conservation, science, and travel - the basics work for any topic including spiritual writing, social issues, health, or whatever topic you're keen on. Larger than Life: The inimitable Edward ‘Ned’ Fritz changed the face of Texas conservation - and had influence nationwide. Before too much time passes, I want to upload the photos from the last day of my trip to Oregon and Washington. I flew into (and out of) the Seattle airport because I found a ticket using frequent flier miles there rather than Portland so just rented a car and drove down to Oregon and all around. 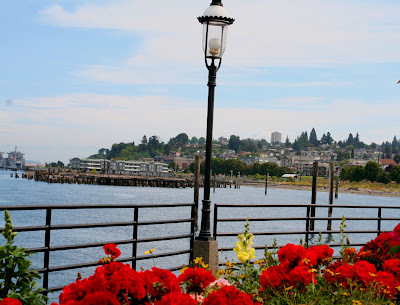 Since my cousin lives in Tacoma (just south of Seattle) I stayed with her on my arrival and departure. 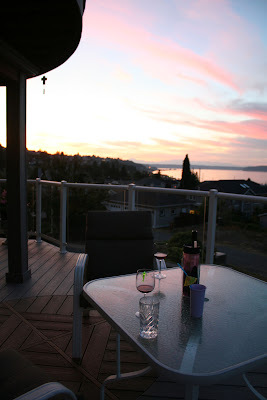 She has a beautiful home overlooking Puget Sound and I always enjoy visiting her and her adorable kiddos! I stayed there in December when I visited and it snowed and snowed and snowed, too! After leaving Portland, I met up for a power unch with my friend Francis Zera, who is an incredibly talented photographer. We collaborated on this story, Candid Camera, for E/The Environmental Magazine and another on paddling Texas rivers for Canoe & Kayak. 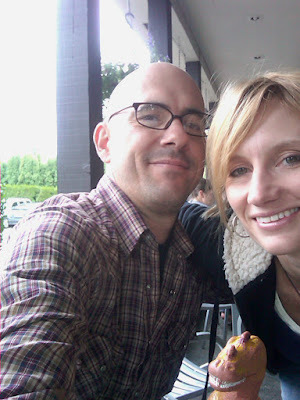 We ate outside on a perfectly gorgeous afternoon at The Ram Restaurant & Brewery, which overlooks Puget Sound. We saw some people out there parasailing, which was very cool. One thing that isn't visible in this small version of the image is Mount Rainier just to the left of the tall building in the distance. If you click and get the larger version you can make it out. Or... you can look below. Aha! 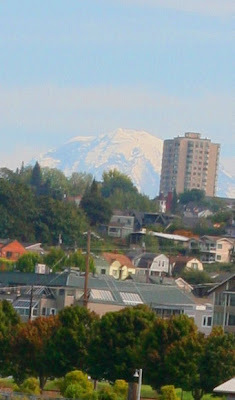 Here it is, Mount Rainer, cropped out of the previous image, in a bigger size. Amazing isn't it? Especially amazing how it's so cryptic when the photo above is small but visible when larger. 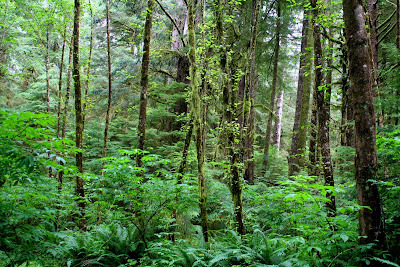 Coastal temperate rainforest in Oregon's Ecola State Park near Cannon Beach. 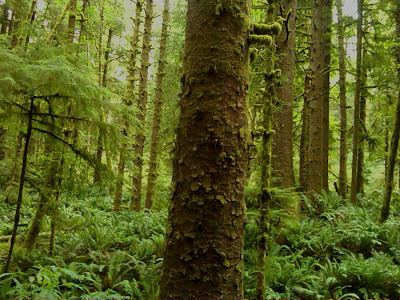 I can still feel the cool moist air of Mount Hood's temperate rainforest on my face and skin. I can still smell the fresh scent of the forest. 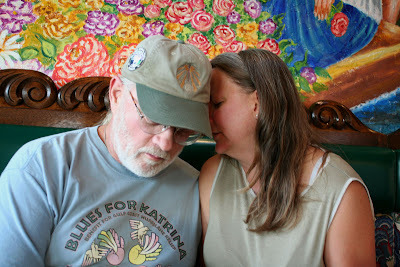 Terri told me to capture that feeling in my mind and go back there when I needed a respite from the world. The air is indescribable. It was so, so, fresh. That's the best word I can think of! It reminds me very much of the forest around my dad's cabin as a child though much of his land has changed since the early days there, back in the 1970s. 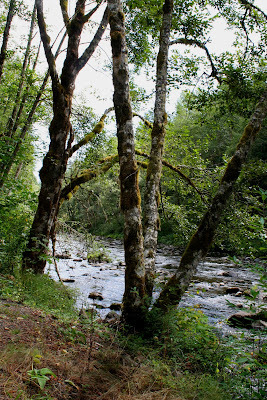 But I have very fond memories of a very lush forest full of ferns, giant trees, rotting logs, mushrooms, streams, Oregon grape, and much more. At any rate, I'm back home in suburban Houston now, trying frantically to get caught up and balance all the many tasks I have with the kids starting back to school, doc appointments, grocery shopping, email catch-up, and spending time with the kids and the like. I had a truly spectacular trip, and loved every single minute of it!! I can't say enough about the joy I experienced every day, to just be there, whether hanging out with my dad and Bev, going solo to the beach, working on blogs and my book chapter at the Fresh Pot coffee shop, hiking, Thai food and Ben & Jerry's ice cream with Terri, hiking at Wildwood, visiting old friends and making new ones, and the laughter and comaraderie shared by the kindred spirits I spent time with there. I still have a few more photos of my trip to upload and hope to do that tomorrow. I'm trying to get some blog posts written and then have a feature to write on bats. I love wildlife! On an unrelated note, here's a link to my latest story in Texas Parks & Wildlife magazine - Larger than Life: The inimitable Edward 'Ned' Fritz changed the face of Texas conservation. Here I am at my cousin's house in Tacoma, about to hit the sack, because I fly out at 6am tomorrow but have to get up at 345am - ack! Yesterday was a very busy and fun day! I'll leave you with some pics rather than write about it! G'nite and I'll see ya on the flip side! 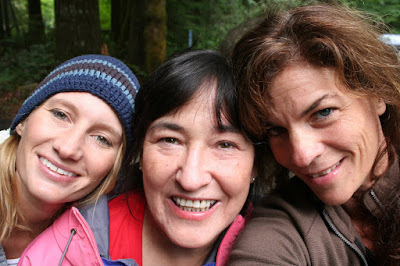 Self-portrait of me, Terri, & Eliza before our hike in the Wildwood Recreation Area on Mount Hood. Eliza & Terri on a wooden bench with salmon carved on it. Salmon spawn on the Salmon River which runs through the Wildwood Rec Area. It was such an amazingly stupendously gorgeous place, the AIR was sooo fresh and everything was so green and lush. It was heaven on earth! And the company was awesome! I love these gals! 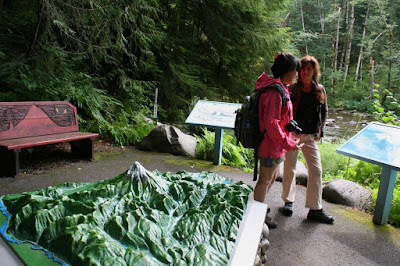 Terri and Eliza chatting by the river with a model of Mount Hood in the background. 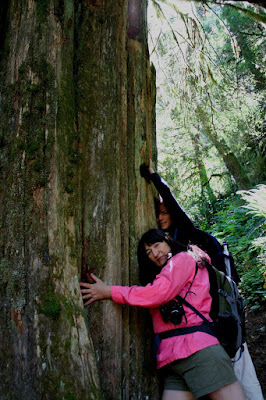 Terri & Eliza hugging a huge tree! Me and Annie Rose - a friend I went to visit the day before yesterday. 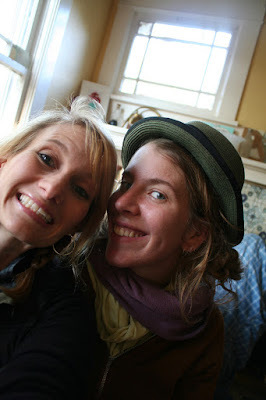 I stayed with Annie Rose back in December when I got snowed into Portland! 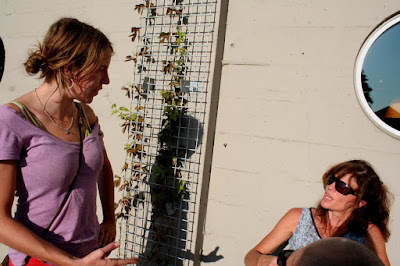 After our hike, we met up with several journalists and writers from the Pacific NW at Hopeworks eco brewpub. 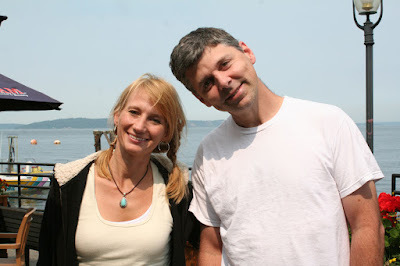 It's Portland's only microbrewery run on 100% alternative energy. 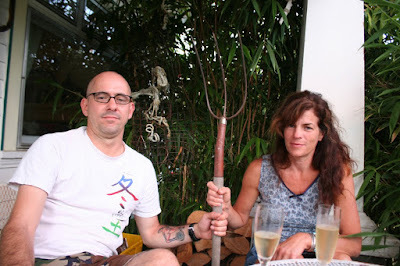 They use organic and locally grown food, and try to make the operations as sustainable as possible. 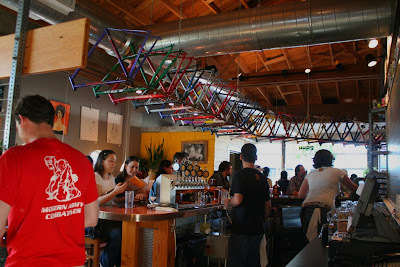 This is a shot of the bar, which is decorated with old bike parts. me, Valerie Brown, Dawn Stover, Orna Izakson, Lizzie Grossman (half hidden), Susan Hess, Terri Hansen and Eliza Murphy. Annie Rose and Eliza chatting outside Hopworks. Telling roadkill stories! A shot of the beer cooler - all of their beers are organic! Elisa, Orna, Terri and I toward the end of our Hopworks get together. But the night didn't end there! 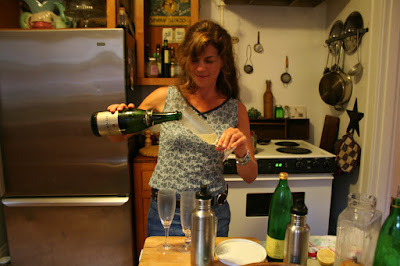 Me and Jimmy went back to Eliza's place and had some champagne! We walked around the neighborhood at dusk and chatted up a storm. Eliza shows us her awesome sculpture and artwork. 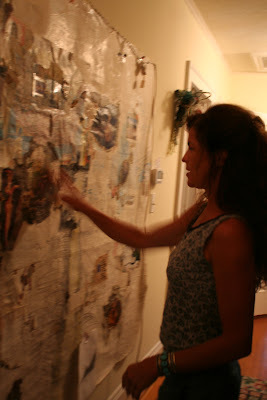 This is a piece on her wall. This is a piece made of two roadkilled frogs. I like this photo! Eliza reads a chapter of her book to us. A shot of her sculpture, The Mermaid, made from garbage collected at the seashore. Notice also "the bird" in the foreground - another small scuplture that I think is really cool! 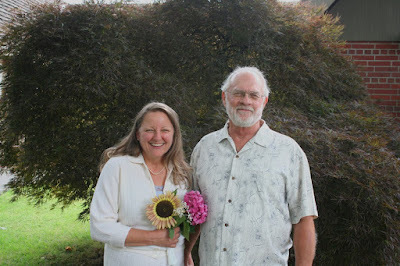 The very happy bride and groom - Bev and my dad - after the ceremony! 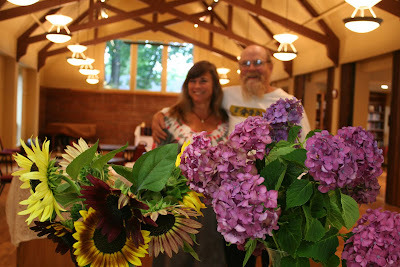 The maid of honor and best man, long-time friends of both my dad and Bev's Jim & Cathy, behind some flowers in the reception hall. 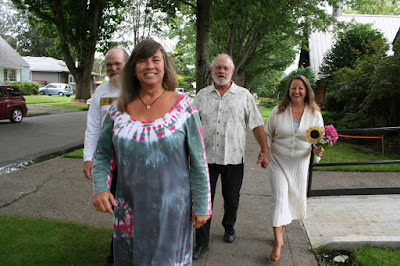 Jim, Cathy, my dad and Bev walking toward the chapel at St. Stephen's Episcopal Church in Longview, Washington. 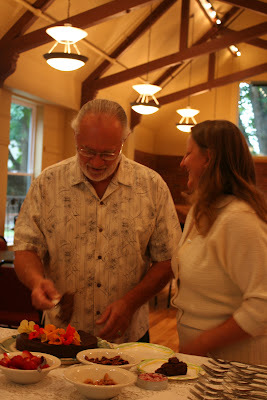 Cutting the amazingly delicious flourless chocolate cake! Help! 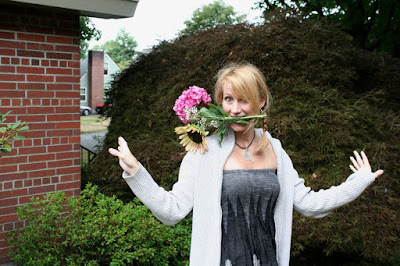 I caught the bride's bouquet! 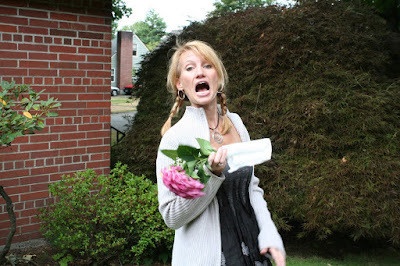 No, really what I did was threw the bouquet in the air and caught it myself. 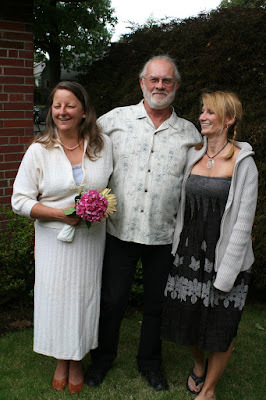 Truly I was the only single person at the wedding I think! "Sand in the sandwiches, sand in the tea, a day at the beach is the best kind of day!" - A line from one of my favorite children's books I used to read to my kids. I'd credit the author but I don't know her name off the top of my head! Yesterday I took a solo day and drove to the Oregon coast. It was a fantastic day! 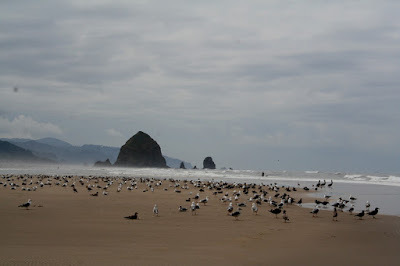 I arrived early-ish to Cannon Beach and walked down to the rocks at the end of the beach then back. 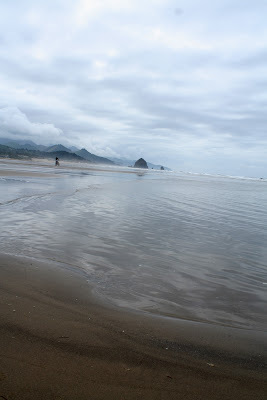 I didn't actually walk to Haystack Rock which was on the opposite end of the beach. 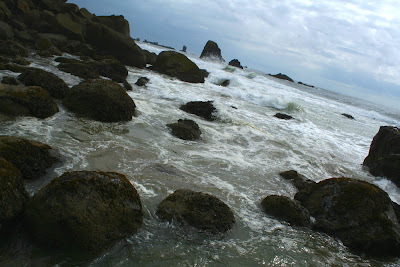 I took lots of photos and just enjoyed being by the OCEAN which I love!! Next I walked around town a bit. It's a quaint little town - some might say touristy but still cool. I had clam chowder at the Local Grill & Scoop and then hit Bella Espresso to work for a bit (they have wifi). 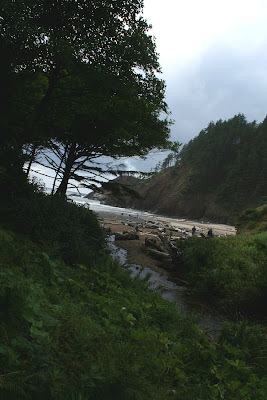 Then I decided to head to Ecola State Park which is supposed to have really cool tidepools. Ecola is just a mile or two from the public Cannon Beach which I hadn't realized or I'd probably spent more time there earlier when the tide was low, but by the time I got there i nthe afternoon the tide was halfway in, and I didn't see any tidepools :( Anyway the coastal temperate rainforest on the drive to the Ecola State Park was mind-blowing. Soooo beautiful and unexpected. Here are some pics from my day! 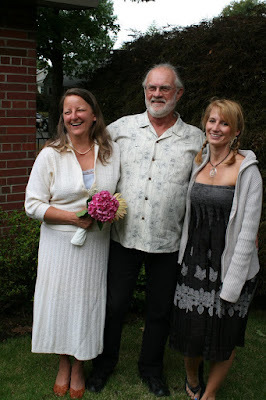 After I left the beach I went to my dad's wedding rehearsal and then dinner. Today was the wedding, but I'll save those pics for later. I'm in Portland now and tomorrow is a get together with a bunch of Pacific Northwest writers and journalists! 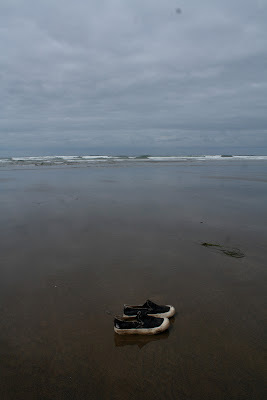 Just me and my shoes and my camera at the Oregon coast yesterday! 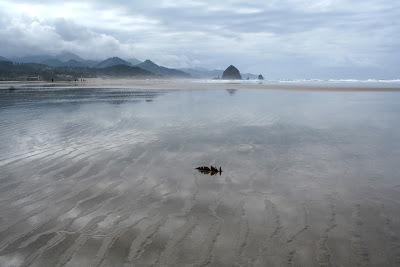 I went to Cannon Beach, which is a couple hours from where my dad lives. I went solo and had an amazing day! I love love love this photo! I went on a long walk along the beach and took this on the way back in. 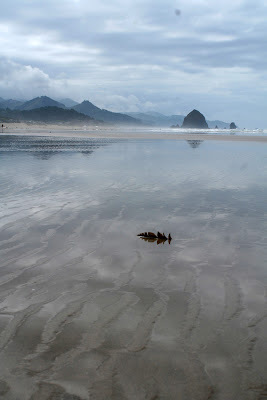 I saw this feather and shot it with Haystack Rock in the background, and the coloration of the water and sand just made it turn out soooo cool! If you blow up this photo you can see a bike ride and the pic looks pretty cool when it's bigger. 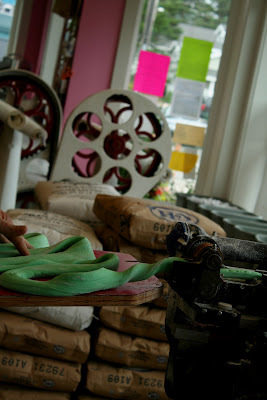 This is a taffy-pulling machine at a candy shop in Cannon Beach which is a cute little town. It was sour apple flavor, and they gave out samples! After I left Cannon Beach, I stopped by Ecola State Park which is just a few blocks from the public beach, but on the way to the beach access you drive through this amazingly lush, gorgeous temperate coastal rainforest - wow! 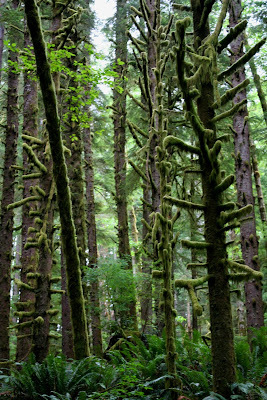 Another shot of the gorgeous forest in Ecola St Park. A view on the hike down to the beach. 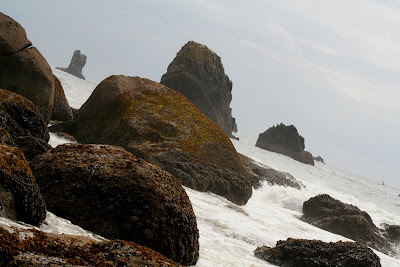 The rocky shore at Ecola State park. 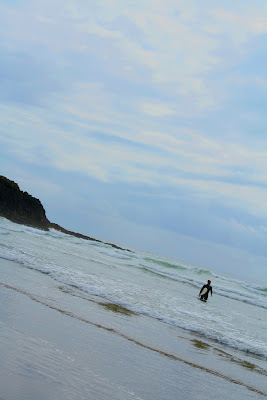 There were a lot of surfers and body-boarders. This pic I thought was cool because of the surfer in the waves. It looks good if you blow it up bigger. 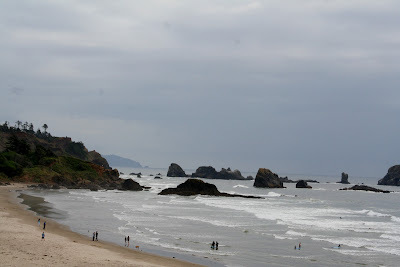 A view of the beach at Ecola State park. I climbed up and on the rocks here, looking for tidepools but the tide was mostly in so unfortunately I didn't get to see any. Major bummer! 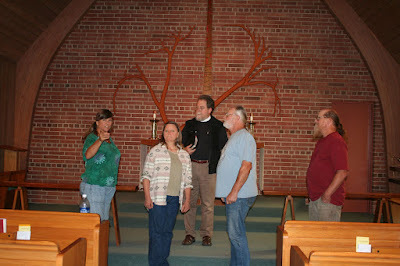 After I left the beach I went to my dad's wedding rehearsal. Here's Cathy (left) pointing because she sees me arriving at the door! That's Bev my dad's fiance (then - now wife) to Cathy's right, my dad, and Cathy's husband Jim. 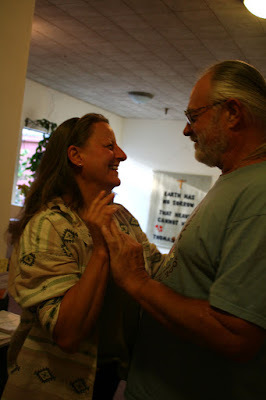 Cathy and Jim live on Meissner Mountain near my dad and are long-time friends. 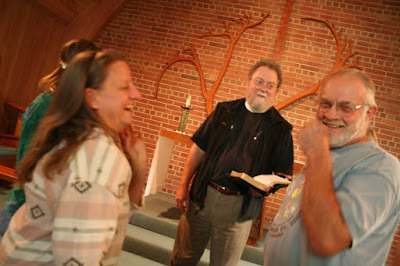 Laughing it up at the rehearsal! Bev has a great laugh! 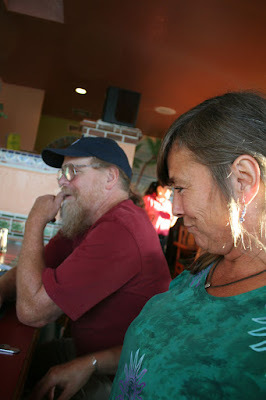 Cathy and Jim at El Tapatio Mexican restaurant in Rainier, Oregon where we went for the rehearsal dinner. Dad heard some music and grabbed Bev for a quick dance. They're all romantic like that! 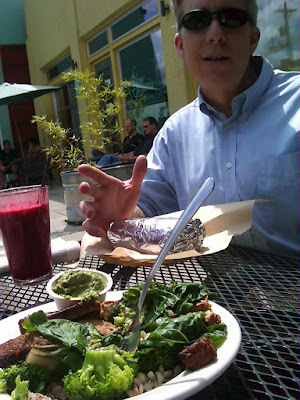 And just for the curious, this is a photo of the "Soylent Green" dish that I had at The Laughing Planet the other day... with my writer friend Ken in the background :) Soylent Green is Swiss chard, broccoli and tempeh over barley and quinoa with cilantro pesto. YUMMO!